In order to determine what has happened in the past geologists study current processes and use these observations to determine how rock layers came to cover our planet. Before the 1800's, geology was dominated by an acknowledgment that a worldwide flood was the cause of these rock layers. This changed when the founders of modern geology, James Hutton and Charles Lyell, succeeded in replacing this interpretation with the belief of uniformitarianism. Uniformitarianism is the belief that natural processes, which are still in operation today, can account for all of the geologic features of our planet. It also assumes that there has never been a massive and rapid accumulation of sediment caused by a worldwide catastrophe. Charles Darwin was heavily influenced by this type of thought when he extended the concept of slow and gradual geological change to include slow and gradual biological change. In the last 30 years many geologists have come to accept as fact that the past has seen rapid geological changes far surpassing anything we see happening today. However, the geological community clings to the belief that there have been millions of years between these catastrophes. The foundational assumption of the creation model is that there has been a worldwide flood in the recent past. If this assumption is correct, there should be evidence for this event. A worldwide flood would have caused massive destruction of plant and animal life followed by a redeposition of this biomatter and sediment over many years. These would result in enormous fossil beds a locations throughout the planet. This is what we find. One criticism of the creation model is the lack of a natural model which duplicates the processes happening during this alleged flood. However, in 1980, the explosion of Mt. St. Helens in Washington provided just such a model. When Mt. St. Helens exploded an estimated 18 billion cubic feet of rock, ash, and dirt, mixed with steam and melted snow flowed down the side of the mountain at speeds estimated at 90 MPH. This, and subsequent ash flows, laid down as much as 600 feet of sediment on the north face of the mountain slope. In essence, the effect of a massive flood event was modeled for the scientific community. The sediments laid down during the violent mud and ash flows were not a homogenized mixture but rather a series of finely layered horizontal strata. They look quite similar to the horizontal layers of rocks which can be observed in road cuts as you travel our interstate highways. These horizontal bands of rock are often assumed to indicate millions of years of earth history but Mt. St. Helens has provided modern geologists with a scale model of how this same type of horizontal strata could be laid down almost instantaneously by rapidly flowing water. Subsequent to the fluid flow down the side of Mt. St. Helens a new river canyon that was formed in one day (March 19, 1982), when backed-up water broke through a natural dam. This canyon is 100 feet deep and looks amazingly like a 1/40th scale model of the Grand Canyon. Had no one been present to see this area form, we might assume that the small stream presently located at the bottom of the canyon had cut the canyon slowly over millions of years. This is the story most of us have been taught about the Colorado river and the Grand Canyon. Many geologists are now coming to acknowledge that just as the Toutle River canyon at Mt. 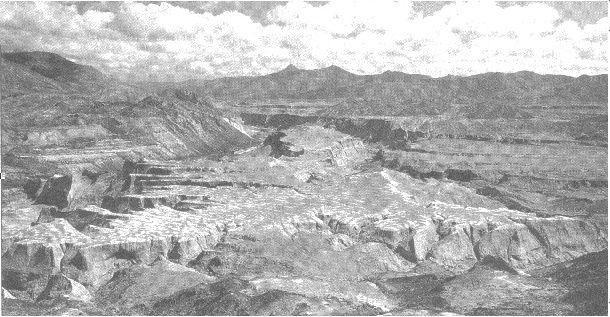 St. Helens formed rapidly, the Grand Canyon was also formed over a short period of time by a massive flow of water. In summary, the majority of the geological community believe that low energy processes and long time periods account for the majority of the geological record. Biblical creationists believe that high energy processes and short periods of time account for the geological record. Only one viewpoint can be correct and the answer you accept affects your view of both God and reality.